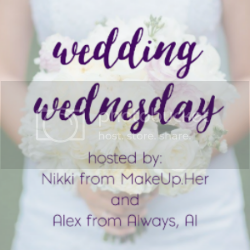 Happy Wedding Wednesday, friends! In honor of the holiday season, I wanted to talk about something a little bit deeper for today's post. 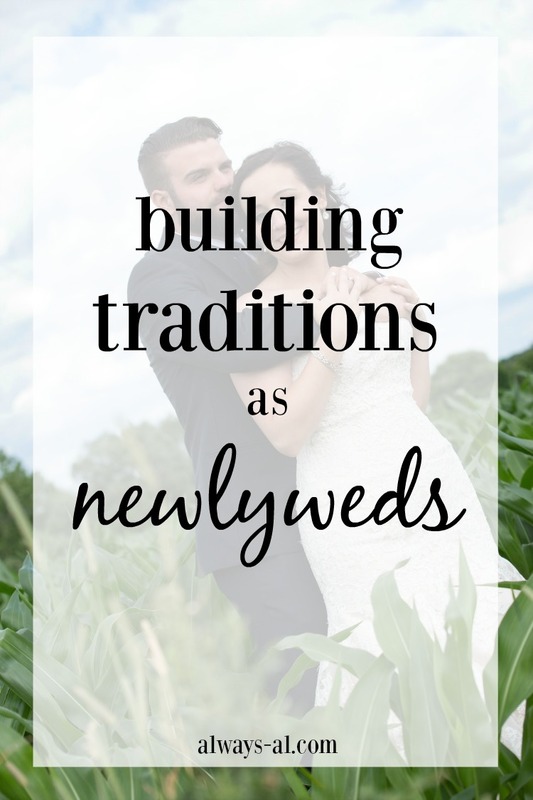 I would love to know if anyone has any tips/strategies for building traditions as a newly married couple. Dave and I have only been married for 5 months, but we started building traditions as a couple when we moved in together in 2012. We knew that we were serious about each other and eventually wanted to be married. Even though we have been together for a long time, Dave and I still work on building traditions all the time. Since this is our first holiday season as a married couple, we have been constantly trying to see what works best for our family. -Make your traditions intentional. Don't get hung up on what you are "supposed to do." This is all about personalization. If something seems like a hassle to you and your family or if it is just a better idea to not, then don't MAKE yourself do it. Because that's just not fun. For example, we are not putting up a Christmas tree this year. Yes, we enjoy them, but we are going to be out of town for Christmas. And we have a 5-month-old kitten, who PROBABLY wouldn't do well with a tree right now. Instead, we hung some lights in the windows, put up our stockings and lit some evergreen candles. Even though we have all the supplies to put up and decorate a tree, this just doesn't work for our family right now. -Figure out what works for your family. Sort of going off the same idea, do what makes you happy and comfortable. When we prepare holiday meals, it is sometimes just the two of us. It doesn't make sense to prepare a ton of different dishes. So this year, we didn't make a turkey for Thanksgiving. Yep, you heard it right. We didn't make turkey because it just wasn't worth it. We enjoyed a bunch of appetizers and sides (and pie!) instead, and it was just as fun. -Your marriage and your family unit are your #1 priority. This might mean that you should skip out on some things. Dave and I had been splitting holidays, and generally trying to cram it all in for YEARS. It can be seriously exhausting. A couple of years ago, we decided to take a breather, and just enjoy some time together. This is probably the BEST decision we have made when it comes to holidays and tradition. We don't feel obligated to run all over the country all the time. And you know what, it's pretty nice being lazy with your partner sometimes. -No apologies. Own your holiday. When we first decided to step back from trying to do it all during the holidays, some family members were a little bit upset. At the time, since we weren't an "official" family unit, they didn't understand that we were trying to make it work for us. But your family will get used to it--I promise you. Once you start owning what YOU want your holiday to look like, it will come much easier for family members to acknowledge. -It's okay to figure it out as you go. So we aren't putting up a Christmas tree this year. We might next year, though. Who knows? Right now we are trying to only travel for EITHER Thanksgiving OR Christmas. But who says that won't change when/if we have kids? Don't put so much pressure on yourself. Holidays are supposed to be joyful, not stressful. Now it’s your turn to link-up and share your wedding tales. I love reading all about your big day, someone else’s wedding adventures, or anything else wedding related. Nikki and I just can’t wait to read all about it!